Today we are welcoming a new Adam Lind card to the collection. 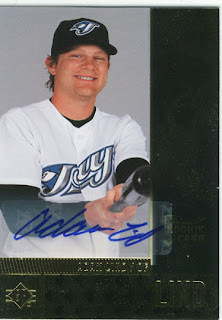 Please give a round of applause to a 2007 SP Rookie Edition Adam Lind RC Autograph. At a whole $2.00, this one was well worth the bargain price even despite the sticker being partially placed over the rookie card logo. I'm not going to lie, the placement of the sticker is kind of annoying but there really is no other place to put it if you look at the card. Now if he actually just signed the card (gasp! ), this wouldn't be an issue. This is going to be added to my Beckett checklist, then put into my binder. For some reason, the only guy's autographs that are in any of my binders are Lind's. All of my others are in snap cases for protection. I guess if he ever pans out he can relocate, though not likely I will care enough to move all of them. I collect Adam as well. Let me know if your looking for something particular as I have a massive amount of his cards. So that's why I've been paying more on eBay!! Looks like I have some competition.